Last week I gave you a general overview of the importance of flooring. 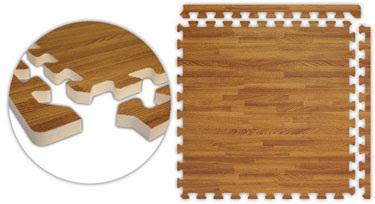 Today I'm going to talk about one option - interlocking floor tiles. As you can see, the tiles are assembled like a puzzle and it's quite easy to put together by yourself. The tiles are very comfortable to stand on and come in lots of colors. They're also eco-friendly - not only do they contain 20% recycled material, but they are also 100% recyclable. Each tile is 2 ft. x 2 ft. in size - since they're modular, you can configure them in an infinite number of configurations. They're lightweight and easy to transport. They're waterproof and easy to clean, making them perfect for outdoor shows. Best of all, you can use them on your studio floor while you work, making them easy to store. These tiles share many of the same qualities as the rubber ones. You can choose from a variety of wood finishes, such as dark oak, light oak, red oak, cherry, and walnut. These tiles offer the warmth of wood with the comfort of foam rubber - it's a great combination. An added benefit is that they add a more sophisticated look to your booth. Once again, these tiles share many of the same qualities as the rubber ones, the most important being that they are have anti-fatigue benefits. They come in a number of colors, mostly neutrals. Not only do the carpet tiles add a cozy touch to your booth, but they also add texture. 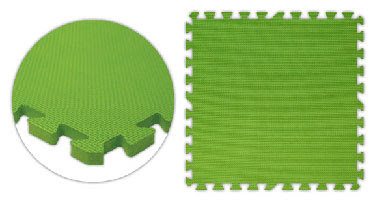 Of the three types of tiles, the carpet tiles are the most expensive. Even if you can't afford a floor to cover your entire booth, you should at least invest in some anti-fatigue mats for where you stand. Take care of yourself! 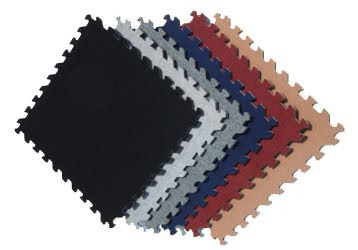 If you plan to purchase floor tiles for your booth, order them all at the same time. Dye lots can vary and you don't want to end up with something inconsistent. Be creative! You don't have to stick with only one color - you can create a pattern with two or more colors, such as a checkerboard or stripes. If you've used any of these types of flooring, I'd love to hear about it! Share your experiences with the B.E.S.T. team by sending me an Email and I'll include them in a follow-up post. Be sure to include your name and a link to your Etsy shop. Many thanks to Camelback Displays for granting permission for the use of their product photos in this post. I've seen them, but wasn't aware that they were reusable. Don't you have to stick them together with some adhesive thingie to get them to stay together? If you use them, I'd love to hear more about it. They look great - but expensive! You'd need to be doing a lot of craft shows to justify the cost of a whole floor of these for your booth. But what a great booth you'd have! I guess if you couldn't afford the whole lot at once, your idea of different colours would be useful. You could buy all the "red carpet" first... then when you felt rich again, you could buy blue to do round the edges...or checks, or stripes..
Great idea - good post, Elissa - thanks!